You may, of course, combine size-choices and still receive the applicable Quantity Discount for multiples. ��The Pefect Travel Checkers Set at an Amazing Price! 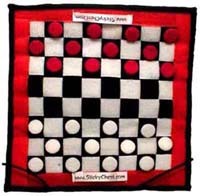 StickyCheckers is the perfect way to play checkers on the run. Unlike magnetic sets, the pieces never slide or fall over, because they are stuck on with Velcro! The board can be folded up and stuffed in your pocket! You can play it on the bus, throwing it back and forth. You can make one move at the base of a mountain, stuff it it your hiking pack, and make the next move at the top of the mountain. The pieces always stick!! StickyCheckers is a perfect alternative to magnetic or electronic sets. If you're very active, always on the go, this is the perfect set for you.